Dr. Compere is a board certified in internal medicine. Currently he is working as an Internist at Penn Highlands healthcare in Pennsylvania. Dr. Compere received his MD degree from St. Matthew’s University, Grand Cayman, West Indies and his bachelor’s degree in biology from Stony Brook University in Stony Brook, N.Y., He did his internship and residency at Capital Health Hospital in Trenton. N.J.
After completing medical school, Dr. Compere was an adjunct associate professor of chemistry at LaGuardia Community College in Long island city. He was involved in research projects at both Capital Health Hospital and at La Guardia Community College. Prior to medical school, he was a lab technician for Estee Lauder Companies in Melville, N.Y.
Dr. Compere has been volunteering in Haiti doing missionary work and providing basic healthcare since 2012. 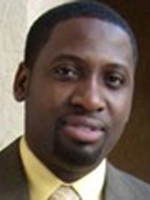 He is a founding member and current Chairperson of the Board of Directors of the National Alliance for the Advancement of Haitian Professionals and a member of the American College of Physicians.